Three days later, on Monday, Nov. 16, 2015, he and his family and supporters were informed that his deportation will be suspended until his appeal can indeed be heard in the Fourth District Court of Appeals. No one on his support team is quite sure why, but some have contacted members of Congress and State Department officials to protest his deportation and ask that his appeal be heard before the Fourth Circuit Court of Appeals.He had used a 20-second courtesy call to say goodbye and thank you to Nicole Lee Wills, a close friend who had done all she could to try and stop his deportation to all but certain imprisonment, torture and possibly even extrajudicial execution. Dr. Léopold Munyakazi, right, poses with his wife, Catherine, and their friend, Nicole Lee Wills, who has organized a Léopold support committee. The Rwandan government accuses Dr. Munyakazi of incitement to genocide and genocide divisionism. 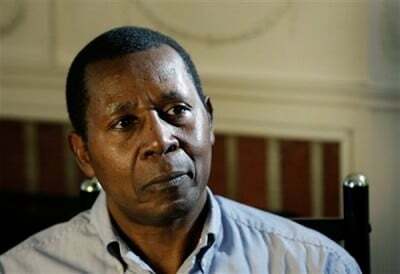 However, the Rwandan government did not indict and issue arrest warrants for Dr. Munyakazi until after he had given several speeches on Delaware and Maryland college campuses, in which he said that the Rwandan massacres of 1994 were a form of class war and fratricide because Rwandans are one people who speak the same language, share the same culture, and marry one another. These statements undermine the justification of Rwanda’s totalitarian government, which is that it stopped a genocide. Attorney Ofelia L. Calderón provided this precise summary of events that led to Dr. Munyakazi’s appeal in the Fourth District Court of Appeals. Leopold was originally detained from Oct. 24, 1994, until Aug. 30, 1999, as part of the post genocide round up [in Rwanda]. He did not receive a trial nor was he actually charged with crimes. According to documents from the Rwandan government, they interviewed individuals in Kirwa who all indicated that Leopold had no part of the genocide. Immigration attorney Ofelia L. Calderón, who has represented Dr. Munyakazi pro bono for nine years. In 2004, he came to the U.S. for a conference and learned he was on a list of individuals with ‘divisive ideas.’ He applied for asylum pro se, which was not adjudicated for four years. During that time, he was a teacher and later a lecturer at Montclair. He gave two speeches where he described the genocide as a fratricide: Oct. 25, 2006, at the University of Delaware and then Nov. 15, 2006, at Montclair. The first warrant was issued Nov. 10, 2006, and the second Oct. 20, 2008. In January of 2009, DHS denied his asylum and referred him to court as well as arresting him in his home. The Rwandan government issued warrants accusing Leopold of inciting the genocide. Specifically, they claim he was involved with a group in or around Kirwa. They claim that he was present at a large meeting where he told other Hutus to go out and kill Tutsis. They also accuse him of genocide negation [a speech crime in Rwanda]. I don’t have any other official statements, but the warrants and indictment themselves. As for the law, a person cannot get asylum if there is evidence indicating that they are a persecutor of others. So, notwithstanding a finding that he has been the subject of past persecution and has a reasonable fear of future persecution based on his political opinion, he was found ineligible for asylum because we were unable to demonstrate by a preponderance of the evidence that he was NOT involved in the genocide. The evidence of the U.S. government consisted of the warrants and reports from a special agent who went to Rwanda to investigate these claims. He interviewed a number of people, most of whom were convicted genocidaires who ‘suddenly’ had information that Leopold was at this April 19 meeting. Phil Taylor interviews Ofelia L. Calderón about the Munyakazi case on the CIUT 89.5fm-Toronto Taylor Report on Nov. 16, 2015. A citizen journalist interviews Dr. Munyakazi about how he had been tortured in prison in Rwanda.